Julien MacDonald OBE is no stranger to our screens. 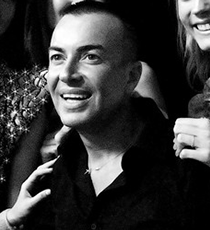 In 2007 Julien was chosen as a judge on the Sky One show Project Catwalk, judging designs alongside Lorraine Candy of Elle Magazine and Elizabeth Hurley. Further to this time on the small screen Julien was confirmed in 2010 as a judge on Britain’s Next Top Model, hosted by Elle McPherson. Series 8 of Britain and Ireland’s Next Top Model transmitted on Sky Living from July 2012. This year he appeared on the highest rating episode of Choccywoccydoodah. Julien studied fashion knitwear at the University of Brighton and received his MA at Royal College of Art, London. Soon after the success of his RCA graduation show in June 1996, his talent caught the attention of Karl Lagerfeld and he was appointed head designer of knitwear for Chanel, as well as for the iconic designer’s eponymous label Lagerfeld, from 1996 to 1998. In 1997, Julien launched his own label with ‘mermaids’, a static presentation of clothes and images photographed by Sean Ellis and styled by Isabella Blow. His first London Fashion Week show was staged for spring/summer 1998. International stars including Beyoncé, Kylie Minogue, Gwyneth Paltrow and Kate Beckinsale have worn his designs. In 2001, Macdonald was named British Fashion Designer of the Year and was appointed as successor to Alexander McQueen as Creative Director of the renowned French fashion house Givenchy, designing both haute couture and ready-to-wear collections. In 2004, Macdonald returned to London to concentrate on his own label. He was awarded an order of the British Empire for his services to the fashion industry in November 2006. In 2012, Julien MacDonald announced the launch of Julien MacDonald bespoke, an in-house atelier dedicated to creating one-off styles, all hand made in Britain. The Julien MacDonald label is manufactured in Britain and is available online at net-a-porter, amongst other prestigious boutiques worldwide. Julien has also taken his designs to the British High Street and designs two diffusions lines called ‘Star’ and ‘Diamond’ which are stocked in UK department store Debenhams. Julien also appeared as a contestant on Strictly Come Dancing 2013.